Columbus Day is a great opportunity to remember the important historical figure, Christopher Columbus. You can celebrate the day with your kids, family of friends and surprise them by sending Columbus Day cards. Columbus Day is a special holiday and you can add more fun to it by creating your own greeting cards. Designing your personalized happy Columbus Day cards will give you a chance to spend quality time with your family and friends and enjoy the holiday together. The greeting card maker by greeting design studio will help you to design personalized Columbus Day cards that will be loved by your family and friends. 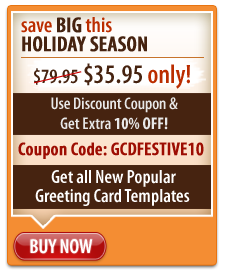 This easy to use software will enable you to design a card with a custom message conveying exactly what you want to say. Why design custom Happy Columbus Day cards? Edit different elements like color, font, and graphics as per your choice. You either design a printable Happy Columbus Day card or e-card. You can instantly upload these cards to Facebook, Picasa or Flickr or send it for your loved ones via email. So get your greeting card creating software now and design appealing and exciting Columbus Day greetings.